Wanipigow is a Cree word meaning "hollow water" or, more literally, "hole in the water." Legend states that in the past, a river flowing west from the country of many hills to the great lake ran into a hole and disappeared. 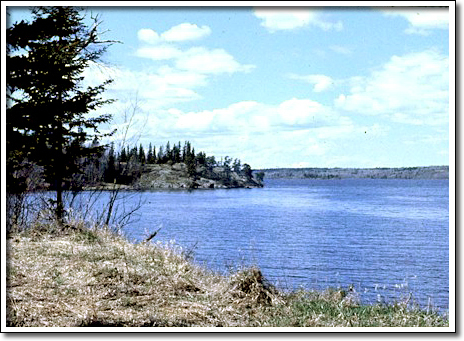 The Wanipigow Lake Archaeological Site contains a wealth of information about past Aboriginal lifeways, making it one of the most significant sites in Manitoba. The earliest habitation began approximately 6,000 years ago. More intensive use of the site occurred about 2,000 years ago by an Aboriginal people known as Laurel, after their distinctive pottery, which was the earliest in Manitoba. The presence of Laurel people represents a shift from a reliance on grassland to forest and aquatic resources such as fish, small mammals, waterfowl and wild rice. The first solid evidence of intensive harvesting of wild rice and goosefoot in Manitoba was found at the Wanipigow Site. The most intensive and continuous utilization of the site occurred between 1,200 and 300 years ago. Distinctive types of pottery known as Blackduck, Selkirk and Sandy Lake were recovered in large quantities. These were made by different groups of Aboriginal people who occupied much of current day Manitoba between 700 and 1640 A.D.